The process begins almost immediately after the previous parade is over. The Pasadena Tournament of Roses Parade officials announce the theme for the next year and the race is on. Float builders and sponsors negotiate contracts and select designs. The metal structure is built onto a vehicle carriage of some sort. 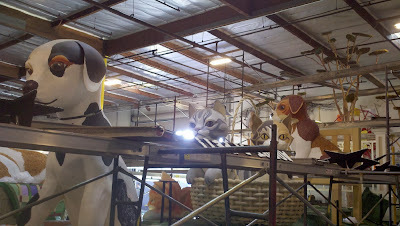 Mechanical and electrical systems are installed and the body of the float is built of plaster and wire and painted. 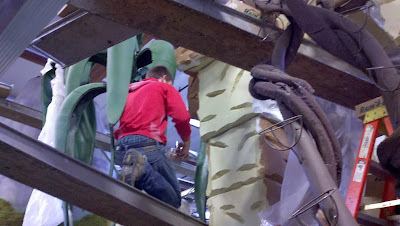 By Christmas Day, the almost completed float is ready for decorators to start. Every square inch of exposed surface must be covered by some form of vegetable matter. That is what happens between the day after Christmas and December 30th. 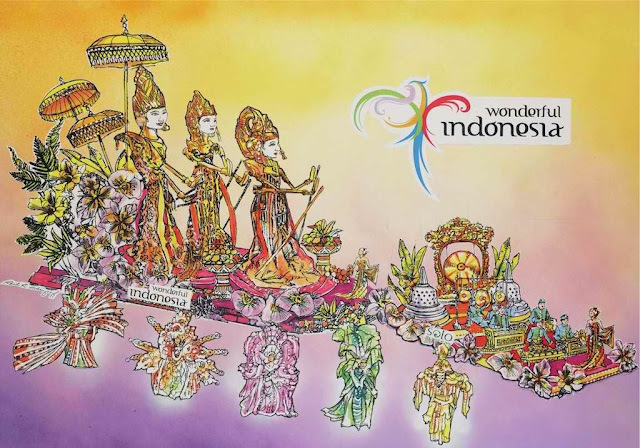 On December 31st, the floats are moved out of the building and to the stadium for judging. So Dec 26, 27, 28, 29, and 30 are the decorating days. Those days are 24 hours long. Of course volunteers don't work 24 hours, but you can work as much as you wish. Fiesta floats begin and end here at the junk yard outside the factory building. 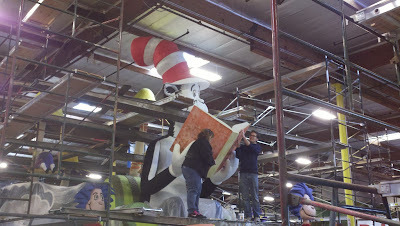 Whether on TV or in real life from the parade grandstand, you don't grasp the size of these floats until you meet them up close and personal on the factory floor surrounded by scaffolding. Here is a description that a former decorator gave me. it’s cold and damp work as they keep the flowers moist, especially at night. It’s quite messy and you can plan on throwing out whatever clothes and shoes you wear as they get very sticky/covered with floral glue. It doesn’t wash out no matter what you do. Some have to work on elevated narrow scaffolding, if you’re physically (and mentally) up to it. There’s also ground level decorating that’s done. The detail work with seeds and petals can be challenging, but it’s also very messy. Some people really enjoy it and have a great time, especially if they are with friends in the group. 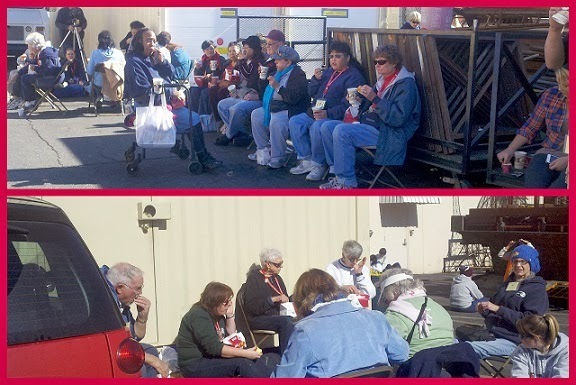 If you’re lucky, the float sponsor or club/group may provide some meals for the workers. 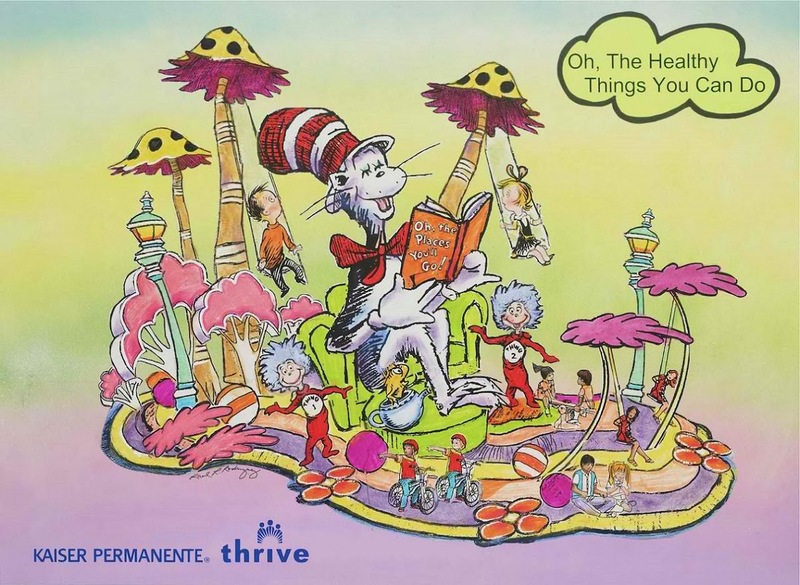 Otherwise, you’re on your own for meals. Expect to work 6-8 hr shifts which run 24 hrs/day for about a week before the parade. They usually want you to work for at least 3-4 days minimum. 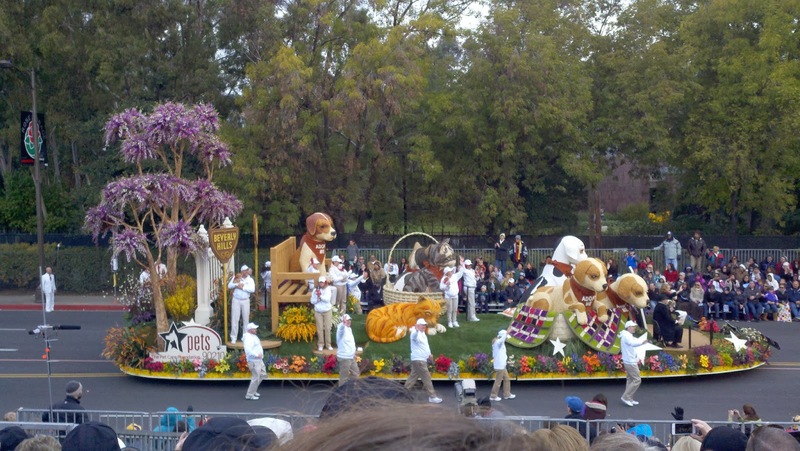 There are numerous locations where the floats are decorated. The final push is the last night, New Years eve, when you work right up until they have to move the floats to the parade starting about 2am (depending upon how far they have to move them.) 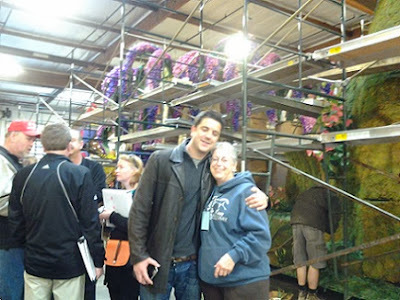 Occasionally you’ll get to see or meet some VIP who’s getting a tour. TV crews also interview decorators for the news. 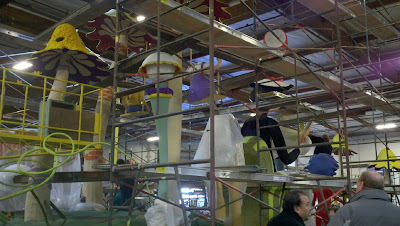 During our experience, Fiesta Floats was constructing ten floats–all in the same building. 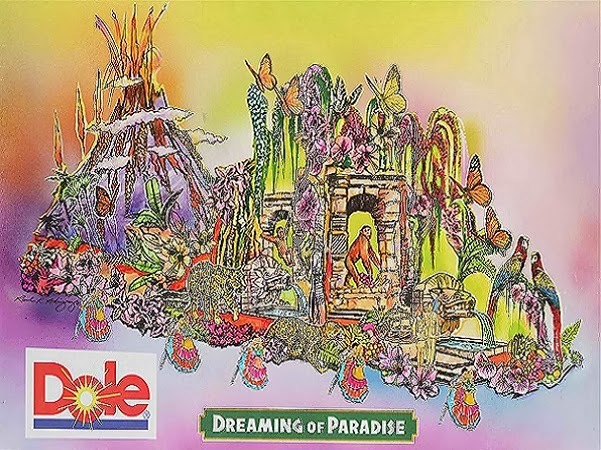 We were assigned to the Dole float. Each decorating crew was led by an experienced project leader who made sure all materials arrived at the right place and time. 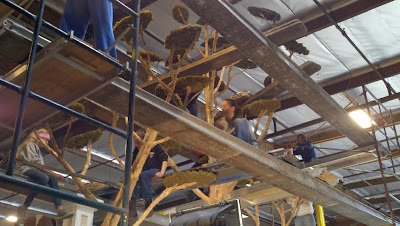 Decorating was done in an orderly manner, working so that decorators were not falling over each other and from top to bottom so that scaffolding could be disassembled as the process proceeded. 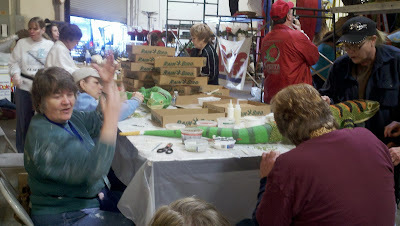 We took individual rest and meal breaks as necessary but the decorating continued uninterupted. Volunteers come from everywhere. Some are locals; both individuals and organizations. Many out–of–towners are checking off an item on their bucket list and stay in local hotels. Some do this as an annual thing, returning year after year to participate with the same organization. My (unsubstantiated) feeling is that very few are RVers. I'll cover other aspects of this adventure in other posts. I think this is enough for one post. When we showed up at Fiesta Floats for work we were blown away by the fact that there were ten floats being built simultaneously in one building. Here I want to display all ten from concept to parade day. I started researching this project early in 2012. I sent email inquiries to everyone I could identify. I got no replies until June when I received this response from Fiesta. Thank you for your offer to help decorate our floats for the 2013 Pasadena Tournament of Roses Parade. It is a lot of hard work but the experience of a lifetime. 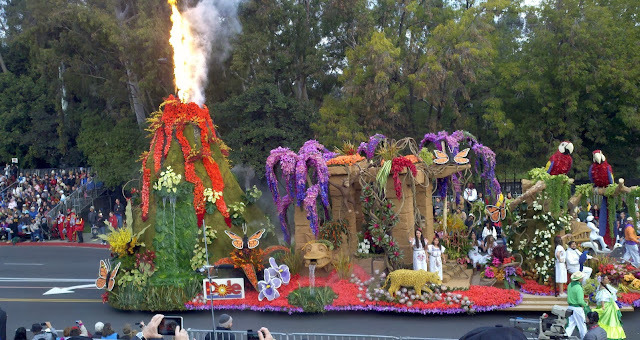 We will begin to decorate the floats with dry materials and seeds on weekends in November and December from 8:00 a.m. to 4:00 p.m. Please contact me in October if interested in working any of these days. We also accept a limited number of volunteer decorators on December 26 through December 29 from 8:00 a.m. to 11:00 p.m. and on December 30 from 8:00 a.m. until completion (we must have all the floats completed by sunrise on December 31). In order to decorate on December 29 and 30 you must have worked a prior shift(s). We do require that you volunteer for at least a six-hour shift. The earlier in the schedule you volunteer the more there will be to do and the more experience you will have to assist in the final decoration stages. 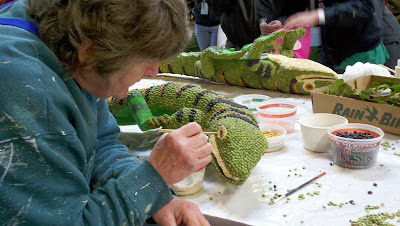 Many people volunteer to decorate every day, as it is so exciting to see the floats take shape. Although many hands are needed to complete our floats we are unable to take large number of volunteers so there is a limit of 6 passes per mailing address. We want to make sure that everyone has a special project and we strive to make it a special event for all our decorators. 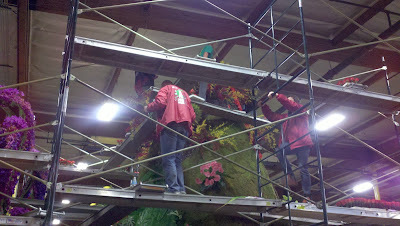 Fiesta Float Supervisors oversee and assign the actual decoration tasks. 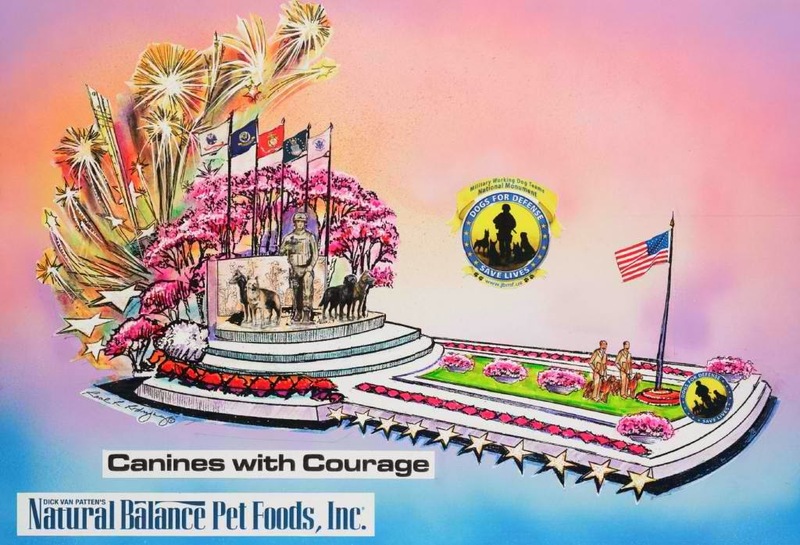 In addition, we have a staff of AIFD floral designers from around the world who create the floral designs and our own detail artists who are assigned specified areas on the floats. All added together, each Fiesta float averages 10,000 man-hours per float just to apply the decoration materials. There are jobs for volunteers of all ages and artistic skills; however, we cannot have anyone under the age of 12 in the work areas. A parent or legal guardian must accompany all minor children. 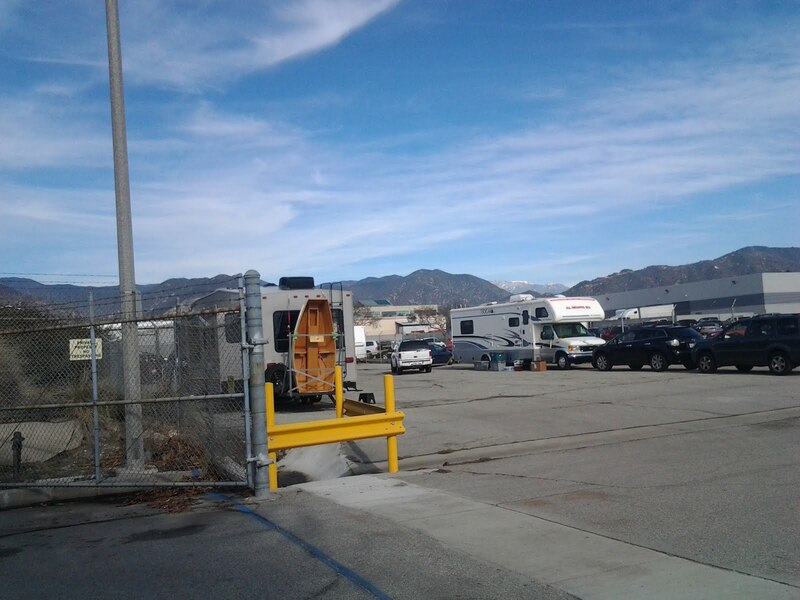 We are located at 16016 Avenida Padilla in Irwindale, approximately 12 miles east of Pasadena. Passes are required to enter our facility beginning December 26 and available beginning early December. Your name has been place on our Decorator’s List but you must contact us in late November / early December with the number of people that will be joining you so passes can be mailed. Parade tickets are available through Sharp Seating ( 626-795-4171) and Rose Bowl Game ticket information is available from the Tournament of Roses Association ( 626-449-4100). Order early for best selection. Local airports include Los Angeles International, Burbank, John Wayne (Orange County), Long Beach and Ontario International. If you have any further question please give me a call at 626-610-0974. Decoration week is a very fun and exciting time. We hope that you can participate and enjoy this event as much as all of us at Fiesta Parade Floats do. Thank you for your interest. Their message was complete, informative, and welcoming. As time went by a few other half–hearted replies came in but none as professional as the one from Fiesta. One subsequent email confirmed that my rig was welcome in their parking lot. 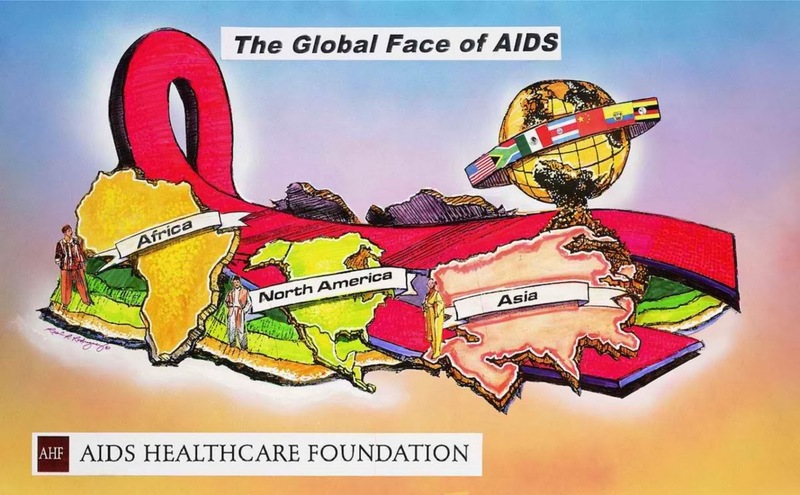 In September I responded and very soon received a complete volunteer package. This convinced me that Fiesta was used to dealing with volunteers and assured me that the experience would be a good one. How close to the build site you want to be is a matter of personal choice. How far are you willing to drive in the dark, in unfamiliar territory, after having a long work day? And then repeat this twice a day for a week? My choice developed like this. Decorating the float was our reason for being there. Long drives, dining out, evening sightseeing, etc. was not part of the considerations. So getting as close as possible was more important than quality of accommodations. I decided on a ten mile radius. I am retired military so I investigated campgrounds at area military facilities–none available within my radius of consideration. A few commercial campgrounds fit the bill, but the prices reflected the fact that we were looking at the busiest tourist week of the year for the Pasadena area. When I began researching this project, I quickly noted that both the Angeles National Forest and San Bernardino National Forest are within reach of Pasadena and surrounding communities. 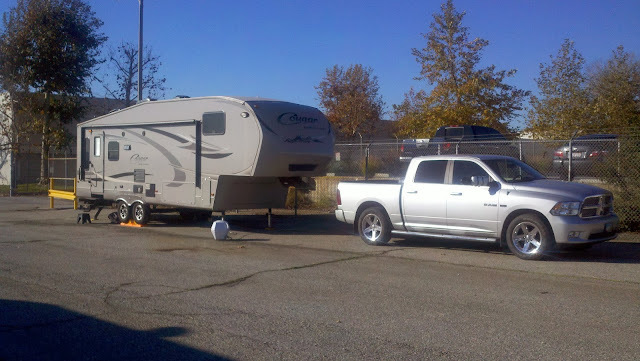 Both have many campgrounds that will accommodate most RVs. I considered the problem solved and moved on to other subjects. When I later returned to get more specific, I discovered ALL CAMPGROUNDS WERE CLOSED FOR THE WINTER!. Don't count on staying there during decoration week. My early emails to float builders always included a query about boondocking on their site. Fiesta Parade Floats was the first to answer my email and the only one to invite me to park my rig in their lot. That won my allegiance. We stayed with them, boondocked in their parking lot, and walked back and forth between our rig and the work building. I cannot provide any information or give advice on other organizations and their facilities. 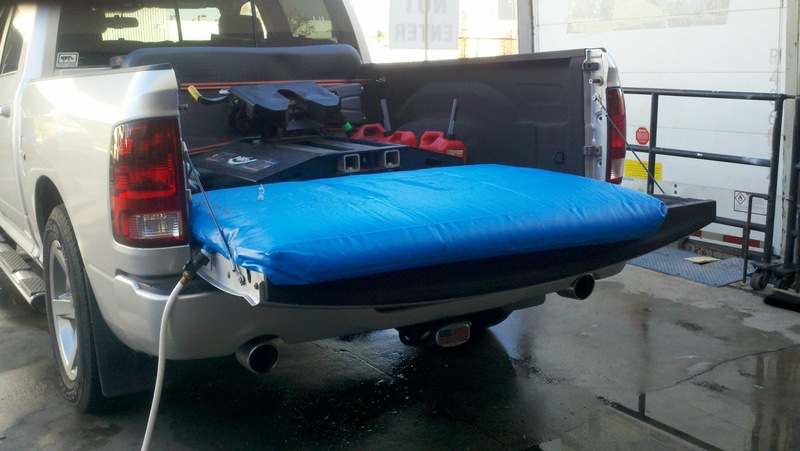 Chances are that if you call you will probably talk to someone who knows nothing about RVs and their requirements. Be very cautious and question extensively. Fiesta stated in their email response that I was welcome to park in their lot while we were working. I took that to mean arrival no earlier than 26 Dec and departure no later than 31 Dec. I learned after the fact that they were not hard over about those dates. Not knowing that, I made reservations for 31 Dec and 01 Jan at the Los Angeles/Pomona/Fairplex KOA, which was reasonably close. During the afternoon of 31 Dec we moved there from the Fiesta parking lot. We spent New Year's eve and New Year's afternoon after the parade and night there. On the morning of 02 Jan 2013, we called this adventure complete and headed on our way. Based on our experience boondocking in the Fiesta Parade Floats parking lot, I will offer the following to inform your decisions. Fiesta Parade Floats occupies two buildings in an industrial park. They share a large, well lit, fenced parking lot with several other companies. The parking lot is patrolled by security personnel 24/7. Employees walk between their cars and their workplace at all hours of the day and night. They allowed us to park along one edge of the lot. Four rigs parked there. I must emphasize that this was a vehicle parking lot with no provisions for RVs. I arrived with all water tanks empty, propane tanks full, and several containers of gasoline for my generator. Once set–up I did not move my rig for the duration. On our way in, we did a grocery shopping to be sure we had enough food to get through the week without having to leave the parking lot. Fiesta Parade Floats allowed me to use their fresh water source to fill my fresh water tank with my bladder. So we were set for the week. I even set out my Tailgater so we could watch a little TV in the evening while the pain killers took effect. Nights were cold enough for the furnace to kick on. PARADE CURBSIDE VIEWING – Curbside viewing of the Rose Parade in designated areas is FREE and available first-come, first-served. 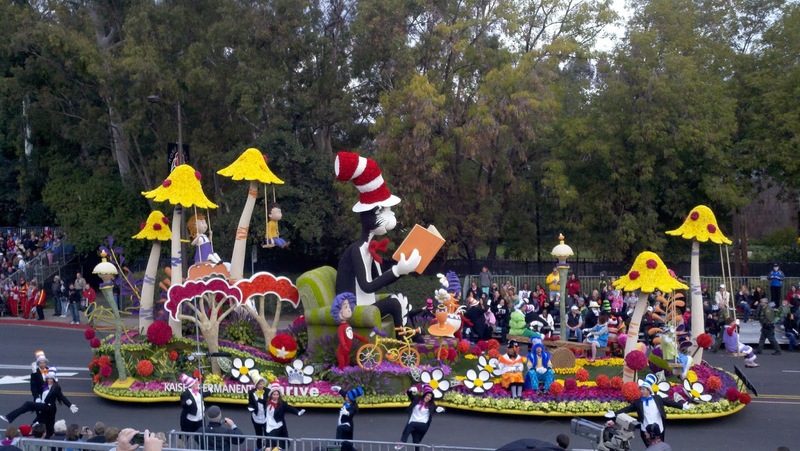 Pasadena city ordinance allows the occupancy of curbside space along the parade route beginning at noon on the day before the parade. PARADE GRANDSTAND SEATING TICKETS – Grandstand tickets are available through Sharp Seating Company, the official grandstand seating provider, beginning in February and extending through 31 Dec. Every person, regardless of age, must have a ticket to sit in the grandstands. However, if a child is two years of age or younger, he/she may sit on an adult’s lap. If not seated on an adult’s lap, each child must have a ticket. For tickets, call 626-795-4171 or go to their website: http://www.sharpseating.com/. This parade route map may help you get oriented. FOOTBALL GAME TICKETS – I know nothing about this subject. Float builders have absolutely no connections to get you discounted tickets either to the parade or the football game. Forget about that. Bite the bullet, buy tickets, and buy them very early. They go on sale in February. Sitting at my computer in February, a couple thousand miles away trying to decide about buying the ticket package, there were too many questions about ‘Curbside Viewing’ to make it a viable option for me. How do I find the 'designated areas'? Does 'curbside' mean in a vehicle or a lawn chair? Where do I park my RV? We decided to attend the parade but not the football game. Tickets were expensive but traveling 2,000 miles and working on a float for a week without seeing the parade would be really stupid. We viewed this as a once in a lifetime event. We also bought the parking package. The complete ticket package arrived in plenty of time and contained seating tickets, parking pass, and abundant information and maps. The parking pass included a large windshield tag that traffic control personnel used to direct us straight to our parking lot. Being able to drive directly to a parking spot at 4AM in a strange town was priceless. This post is all the contact information I developed while researching this project. Keep in mind that I did all this during the year 2012 and I have not tried to keep it updated. I'm sure some information is no longer valid, but this will give you a starting point. Also be aware that many of these contacts are not staffed all year. After the Rose Parade is finished, it may be a few months before someone is available to answer the phone and answer emails. For Phoenix Decorating, size is the sell. The firm contracts to build many parade floats, and it employs a full-time staff of about 300 workers in two Pasadena facilities. 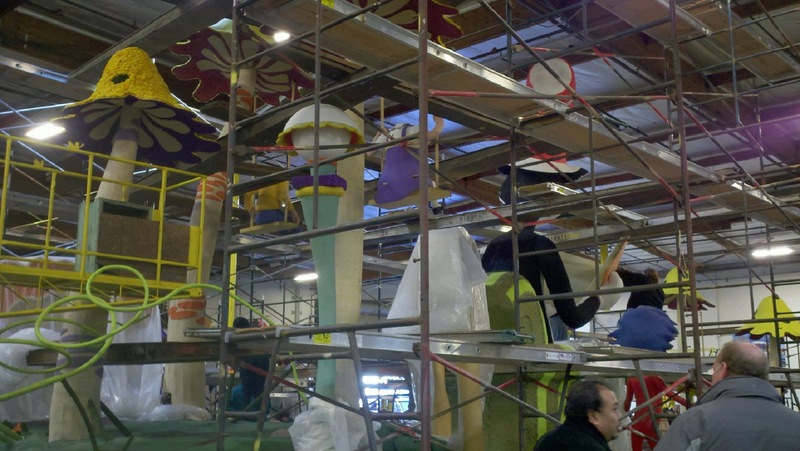 Fiesta Parade Floats touts its track record with the judges. 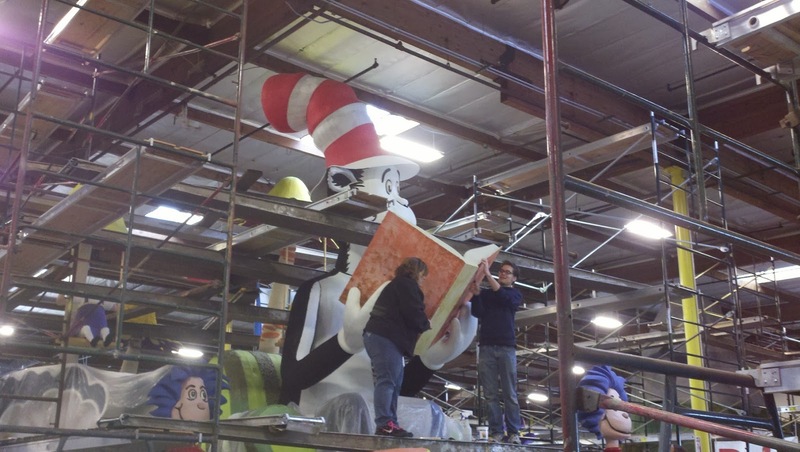 The company says 67% of the floats it has entered over the last 20 years have won awards, which it says is the highest rate among the existing builders in the parade. Technology is the key for Artistic Entertainment Services (AES), which employs about 60 workers. AES says it excels in the use of state-of-the-art technology, including robotics and lasers for sculpting and casting floats. 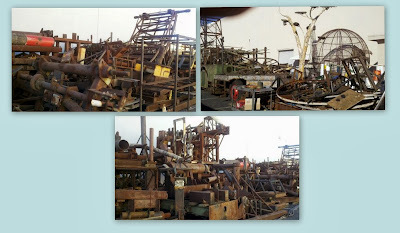 AES also uses its equipment to build floats for Disneyland as well as signage and props for Universal Studios Hollywood, among others. 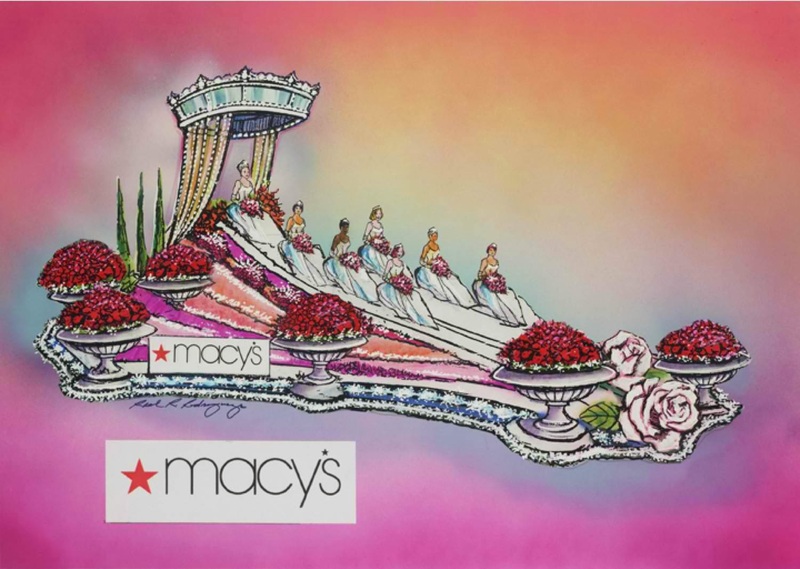 Paradiso Parade Floats is a boutique ﬂoat builder. At Paradiso they create a floral masterpiece and a unique, personalized experience for each client. 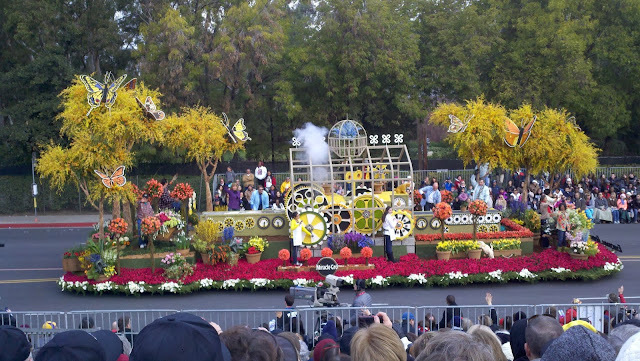 The annual Rose Parade on New Year's Day in Pasadena, California, USA, is arguably the largest public relations project of Rotary clubs in the United States and Canada. Since 1924, a Rotary float has been entered 25 times, including every year since 1981. North American Rotarians fund the entry, which high-lights a program or service theme. The Mission of the South Pasadena Tournament of Roses Committee is to create positive exposure for the city through participation in the Pasadena Tournament of Roses, which will elevate the community and the organization by using principles based on voluntarism for the successful completion of the annual floral entry. 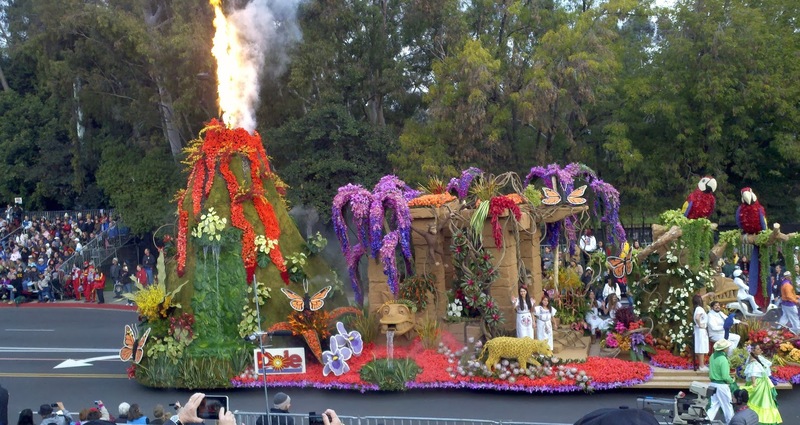 They boast of "The Oldest Self-Built Float in the Rose Parade"
The community of Sierra Madre is one of the oldest participants in the Pasadena Tournament of Roses Parade, having entered a float since 1917. 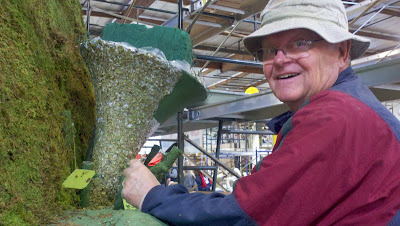 The 2013 entry is their 81st entry into the Pasadena Tournament of Roses Parade. Today, the Sierra Madre Rose Float Association designs, builds, decorates and completely funds the community’s annual entry. 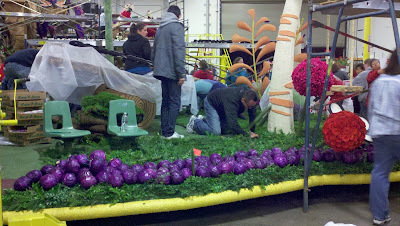 Carrying on a local tradition, theirs is one of only a few all-volunteer-built floats remaining in the parade. 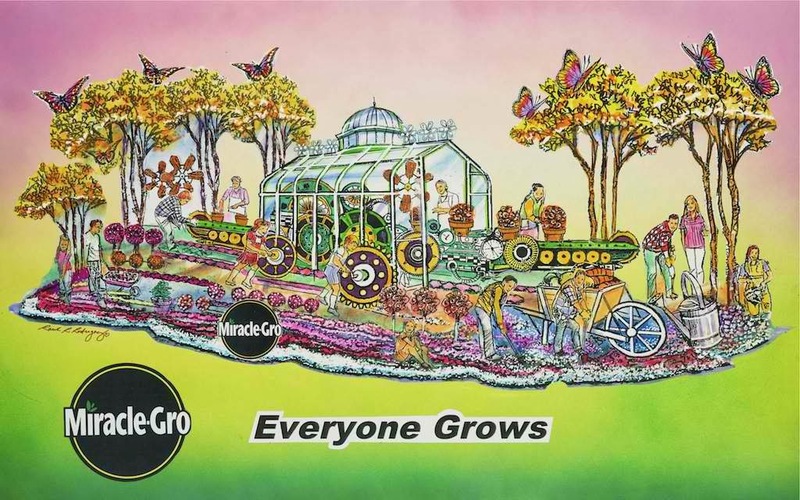 Sierra Madre Rose Float Association is a non-profit, all volunteer organization dedicated to entering a float in the annual Pasadena Tournament of Roses Parade. They are a totally “Self-Built” float – they design, construct, decorate and raise the necessary funds to produce their float every year. Funding is achieved through donations, memberships and local fund raising activities. 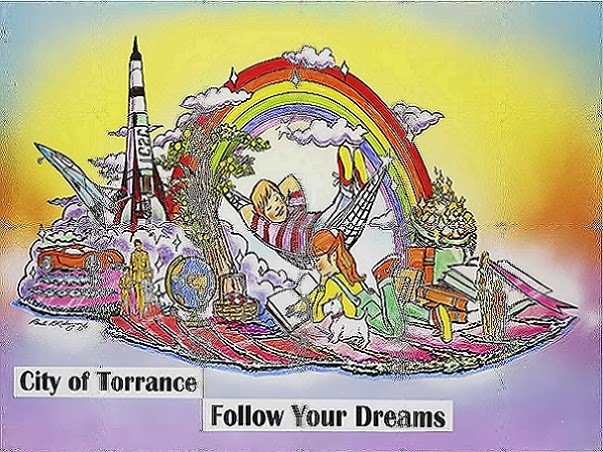 In 1952 a group of citizens founded The Downey Rose Float Association (DRFA for short) and incorporated in 1954. Continuously since 1955 this group of citizens has worked to enter a float in the Tournament of Roses Parade on New Year’s Day. Downey’s entry has the distinction of being one of only six floats which come under the parade classification of self-built. This classification means their float is completely financed, constructed and decorated by volunteer contributions and help. 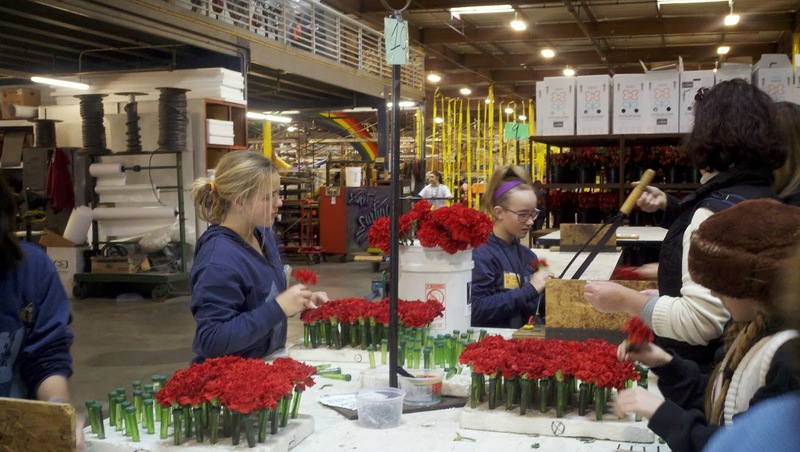 The Burbank Tournament of Roses Association is an all-volunteer, 501(c)(3) non-profit organization that designs, builds and decorates the City of Burbank's entry into the annual Pasadena Tournament of Roses Parade. 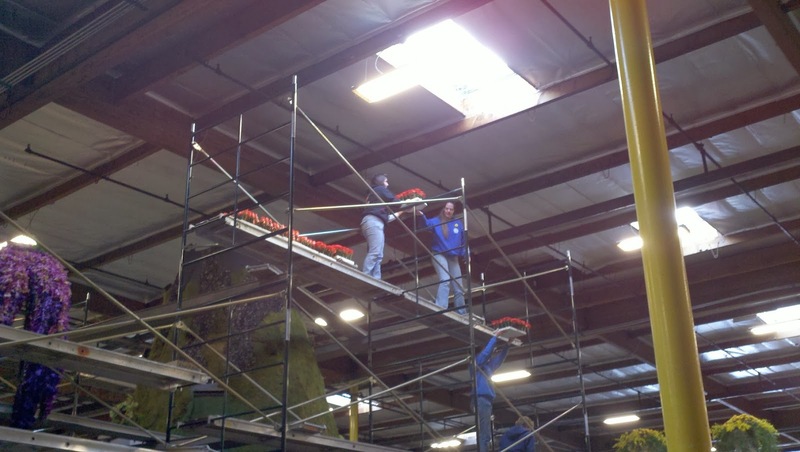 Cal Poly builds floats at two locations. I have no indications whether or not they accept volunteers from the general public. I have included them for the sake of completeness. 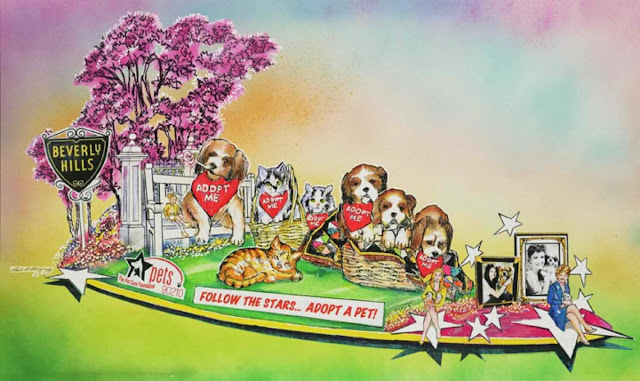 The Mission of the Rose Float Leadership Committee is to develop student leadership, teamwork, and life skills through the collaborative and creative process of designing, building, decorating, and entering a Rose Float in the Pasadena Tournament of Roses Parade. The Mission of the Rose Float Club is to promote the success of the rose float program by supporting the leadership committee, recruiting volunteers, promoting the organization to the campus community, general public, and private industry, creating a rose float family “feel” through meaningful engagement, including but not limited to, newsletters, fundraisers, club fairs, merchandise, and events. Today turned out to be a travel day instead of a float building day. Yesterday (Christmas), we packed up in anticipation of traveling from Yucca Valley to Irwindale. A trip of 98 miles should have been a piece of cake. We traveled about 100 yards. The brake on the left rear wheel of the fifth wheel seized up whenever we stepped on the brake. So we didn't even get out of Black Rock Canyon Campground. Naturally, being Christmas Day, I could not get any RV service establishment on the phone. So we settled down for an extra day. Packing up and setting up in the same place in one day was a real bummer. Especially since it was blowing rain and snow. Having had a night to sleep on the problem, I woke with the idea that I could cut the electric wire to the offending wheel brake. That would let me travel, carefully of course, to our next destination. I called both Keystone and Colerain to confirm the workabilty of the solution and they confirmed. We packed up and made the trip to Irwindale. By the time we arrived all of the brakes were acting up but not seizing up. We set up in the parking lot of Fiesta Parade Floats, met our work contacts, and crashed. What a day. This is not a campground. There are no hookups. 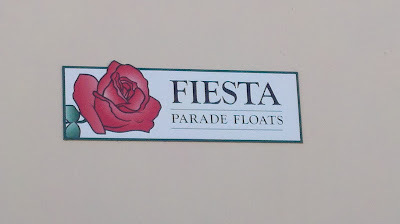 Fiesta Parade Floats allows those volunteers arriving in an RV or towable to boondock in one corner of the parking lot. This week we practiced real boondocking including getting acquainted with our generator and exercising our fresh water bladder system. They both work fine.